The new kid on the block — Nirvana Bistro — is a cafe that moonlights as a community for artists, travellers, storytellers, and beyond. Go here to not just eat, but to chill with likeminded peeps and musicians. Think of free-spirited aura, vibrant conversations and an ambience where everyone feels inclusive and collaborative. That is Nirvana Bistro for you. Drawing diverse sets of crowds from different parts of the city, this bistro is where you stumble upon local artists, groove to the tunes of upcoming (and popular) musicians, add your voice to conversations that matter (a wide range of topics from LGBT rights, organic farming, and more are discussed here) or simply be a spectator. No matter what you intend to do, Nirvana will wrap you in its raw and real honesty about art. 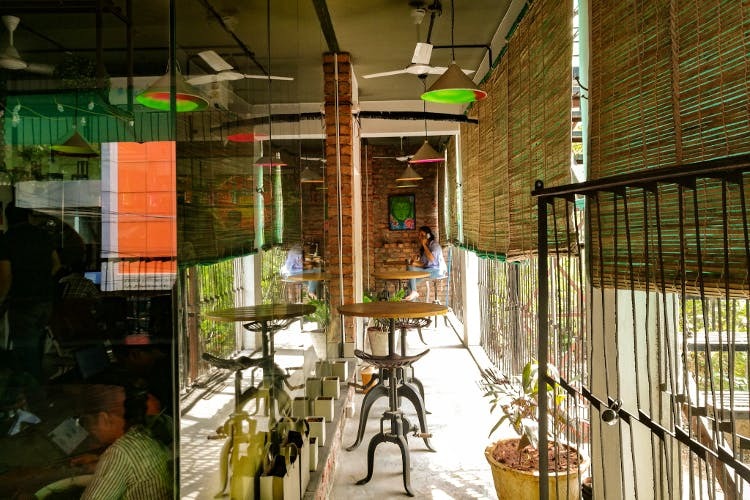 Nirvana is dainty but has an outdoor seating as well as an indoor section which is quite Bohemian with wall art that jumps at you, lampshades and colourful glass bottles, hung from ceilings etc. The indoors are more comfortable with bean bags, lounge chairs for you to relax. Plus, it has WiFi, so you can co-work with your workmates too. Did we also mention that the walls outside are open for painting and we think it can be a canvas to your imagination! Nirvana’s menu is limited yet interesting. Although Sambar Maggi was the first item on the menu that grabbed our attention, we decided to pick authentic food over fusion. We started off with Cheese Maggi, Signature Sambar Rice, Pickled Leaf Rice. The Maggi arrived and it was demolished within minutes; it was cheesy but spicy and peppery (perfect for them monsoon evenings). Soon followed the Signature Sambar Rice accompanied by papad and crisps — the sambar hits close to home and we relished it. What arrived, in the end, was the best — Pickled Leaf Rice which is basically rice mixed with a homemade pickle and is served with raita. For drinks, we sipped on Guava Pop (a chili guava drink), classic buttermilk, and a jeera-based drink and for us, the Guava Pop was the clear winner. Whether you’re looking for pocket-friendly meals with a twist or a collaborative cafe for you to jam in the evenings or cheer the ones making art, Nirvana’s got to be your de facto choice. Don’t blame us for getting hooked to this space, again. If you are an upcoming artist and looking for a space to host a workshop, get to Nirvana and strike a conversation with Kapil or Shravani and see where it goes.